Yves Cuilleron, Pierre Gaillard et François Villard, three of the most notorious wine producers of the northern Rhone Valley had a dream to offer a renaissance to the vineyards of Seyssuel, a small village at top northern part of the Rhone Valley, about 6.5 kilometers northwest of the town of Vienne, and about 13 kilometers north of Ampuis (the capital of "Cote Rotie"). They did it with passion and pleasure, and their dream came true when the adventure started in 1996, by first renting and restructuring some small parcels of land. Vienne was even "Roman" before the Roman conquest of Gaul by Julius Caesar. It was the capital of one of the provinces of Septimania, which only became French in the thirteenth century. The Roman Viennoise county extended from Lake Geneva to the door of the city of Arles on a wide area. The inhabitants of the city of Vienne enjoyed significant privileges and had access the highest offices of the Empire. They were exempt from paying the tax. When a bridge was built, the city lies on both banks of the Rhone. The poet Martial (1st century) called the city then, "Vienne-la-belle". The Vienne area wine’s fame dates from the time of the Empire Roman. In his writings, Pline l’Ancien (the Elder) indicates that one planting to black grape called Vitis Allobrogica, grown on the territory of Vienne, and gave three crus: Sotanum, Taburnum and Heluicum, according to the soil and the vineyards. Remaining very popular until the late nineteenth century, Seyssuel vineyards suffered greatly during the war of religion in the 16th Century, then the vineyards were resurrected and expanded (120 hectares/ 296.5 acres of vines in 1820) until their total destruction by phylloxera in the 1890s. Only a small part was replanted during the 20th Century due to the difficulty of its hilly terrain, impossible for mechanical cultivation, the vineyards of Seyssuel. The hillside or “Coteaux” were left, abandoned until 1996, despite many tentative of restoring and restructuring prior Cuilleron, Gaillard and Villard. Yves Cuilleron, Pierre Gaillard et François Villard count amongst the pioneer that emphasized the rebirth of the northern Rhone in the 1980s. Three winemakers, three different approach of winemaking. Les Vin de Vienne succeeded this alchemy: fusion the sensibility of the three in one efficient team spirit. The collective commitment to produce high quality Vin de Vienne comes naturally from the combination of each producer's skill and experience. They literally revived the popularity of the Vins de Vienne. To complete their adventure, grow their portfolio and add another point of view and winemaking skills, they introduced recently the name of a fourth person on their label, which is quite justified because he is the proprietor of the estate at Seyssuel. The fourth crony, like the 3 musketeers that were four, Pierre-Jean Villa joined them in 2003 and now runs the domain. Vin de Propriété: Estate wines, from the estate in Seyssuel, which include "Heluicum" and "Sotanum"
Les Archeveques: parcels selection in specific vineyards. Christian Dalbavie make me taste two of them "Heluicum" and "Sotanum", and I found them both extremely well crafted and like to share them with you. The name Heluicum is in reference to Helios, the sun in Greek mythology. 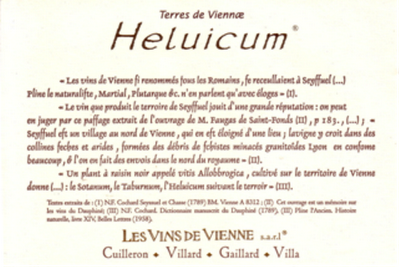 Crafted from 10 years old vines planted on hillsides, 100% Syrah from the Northern Rhone Valley, "Heluicum" is one of the various wines produced by a joint venture from Northern Rhone most notorious Master winemakers: Yves Cuilleron, Pierre Gaillard et François Villard, and Pierre-Jean Villa. The vineyards are under sustainable, organic methods. The soil is predominantly composed of schist stones with quartzite and micaceous shale, which confers great minerality to the wines. Fermentation occurred with natural yeasts, with pigeage and remontage. Then the wine was aged for 16 months in French oak barrels. A superb wine, 2008 Tierra de Viennae "Heluicum" shows deep ruby-garnet color. The nose expresses lovely, earthy aromas of cassis, black berry, garrigues, violet and pepper. Extremely well crafted, the palate is juicy, a touch spicy, with high acidity and great balance and focus. Flavors of cassis, violet, and garrigues gently evolve and expand with even more earthy, floral and ripe berry fruit notes, toward the long, seamless, earthy, soil oriented, juicy finish. $40 may appear a bit high to spend in this economy, but for a wine of such quality, it is definitely worth it. I love it. Small quantities, old vines and organic are three factors that account for the price. However, even if I am the king of under $15, and if I usually prefer to ambush wines under $20, sometimes it is good to Indulge a little and fall into a surprising ambuscade like this one. 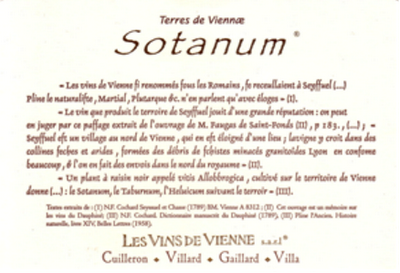 Crafted from 15 years old vines planted on hillsides, 100% Syrah from the Northern Rhone Valley, "Sotanum" is one of the various wines produced by a joint venture from Northern Rhone most notorious Master winemakers: Yves Cuilleron, Pierre Gaillard et François Villard, and Pierre-Jean Villa. The vineyards are under sustainable, organic methods. The soil is predominantly composed of schist stones with quartzite and micaceous shale, which confers great minerality to the wines. Fermentation occurred with natural yeasts, with pigeage and remontage. Then the wine was aged for 16 months in French oak barrels. 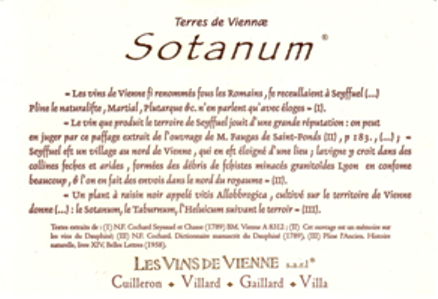 Also excellent yet more expensive, 2008 Tierra de Viennae "Sotanum" presents a medium ruby robe, with bright reflects. When tasted, the nose was somewhat restraint, less expressive and lighter than the previous wine, may be a bit close at the moment; yet, it didn't mean anything because, on the palate, it was boasting more complexity, length and depth. With similar mouthful attitude and flavors profile than Heluicum, it is a better wine, more refined and integrated, showing more inciting features yet with less primary fruit flavors. Somewhat more cerebral, less youthful, vibrant and friendly than Heluicum. Food friendly, this wine needs a good hour of decanting and will pair well with hearty dishes. A little introduction to Sake: the Japanese wine!